Cholesterol...Is It Really That Bad? Cholesterol…Is It Really That Bad? Cholestero l is a fatty substance which is present naturally in the body. It performs several vital functions. Your body makes all the cholesterol you need. You need only a small amount of fat in your diet to make enough cholesterol to stay healthy. Your body needs cholesterol to build new cells, insulate nerves, and produce hormones. The fat you eat is absorbed in the intestine and transported to the liver. The liver converts fat into cholesterol and releases cholesterol into the bloodstream. If there is the excess amount of cholesterol in the blood may get deposited in the walls of arteries. There are two main types of cholesterol out of which low-density lipoprotein (LDL) cholesterol is known as bad cholesterol. High levels of LDL cholesterol are linked to atherosclerosis, which is the accumulation of cholesterol-rich fatty deposits in arteries. This can cause arteries to narrow or become blocked, slowing or stopping the flow of blood to vital organs, especially the heart and brain. The second type of cholesterol is called as high-density lipoprotein (HDL) cholesterol also known as good cholesterol. People with levels low HDL cholesterol are more likely to develop atherosclerosis, heart disease and stroke. Poor eating habits : Foods that are high in cholesterol, such as red meat and full-fat dairy products, bakery products can increase your total cholesterol. 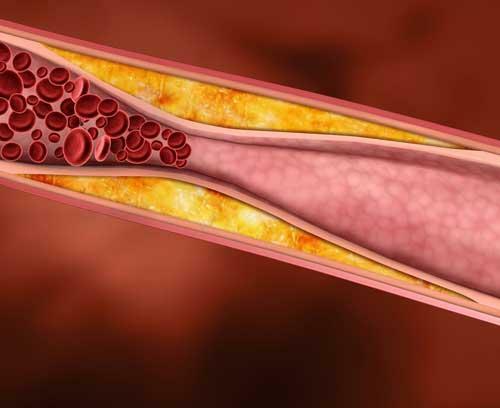 Most people with high cholesterol don’t have any symptoms until cholesterol-related atherosclerosis causes significant narrowing of the arteries leading to their hearts or brains. Atherosclerosis affecting the heart is called coronary artery disease, and it can cause heart-related chest pain (angina) or heart attack. 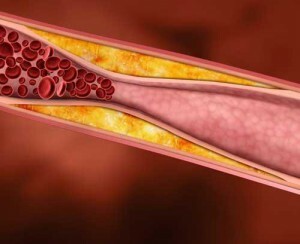 When atherosclerosis blocks arteries that supply blood to the brain, it can cause a stroke. Some people may experience nodules filled with cholesterol over various tendons, especially the Achilles tendons of the lower leg called as xanthomas. Cholesterol deposits also can occur on the eyelids, where they are called xanthelasmas. How to manage high cholesterol? High cholesterol can be inherited, but it’s often the result of unhealthy lifestyle choices, and thus preventable and treatable. A healthy diet, regular exercise, and sometimes medication can help in reducing high cholesterol. Losing weight, being active, regular exercises for 30-60 mins daily will help you to reduce your bad cholesterol. Homeopathy medicines are helpful to treat the symptoms and condition related to abnormal cholesterol level. Homeopathic medicines will help to lower LDL cholesterol and triglycerides, raise HDL cholesterol, and also enhance immunity system. Homeopathic remedies can help to maintain cardiovascular function and a healthier circulatory system. Homeopathic treatment is absolutely safe and free from any side effects. To know more about how homeopathy can help you, you can leave your details below and have one of our doctors’ call you back. Alternately you can get in touch with us via telephone (+91-22-66888888) or email (info@lifeforce.in).